The gross hypocrisy and outright cynicism is difficult to believe. Focus on the Family is bringing their notorious “ex-gay” road show, Love Won Out, to Grand Rapids, Michigan this week. In response, Grand Valley State University is hosting my presentation, followed by a panel discussion on the danger of ex-gay programs. Focus on the Family is livid and demands that the panel include anti-gay Focus on the Family speaker Michael Brown. They are urging their huge mailing list to complain and bully university officials. “The ‘Religion and Homophobia’ panel discussion seems awfully one-sided for an event sponsored by the school’s ‘inclusion and equity’ department,” wrote Gary Schneeberger, vice president of media and public relations at Focus on the Family. Focus on the Family might be taken seriously if they had actually extended an invitation to gay advocates and pro-gay preachers to speak at Love Won Out. I’d be more than happy to present my slide show, “Pray Away The Gay” on Saturday, at the Focus on the Family event. 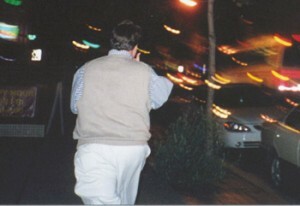 I’d even bring along the original photograph I took of Love Won Out’ ex-gay founder, John Paulk, (pictured) fleeing a gay bar. Unfortunately, no such invitation was forthcoming. It seems that Focus on the Family has a double standard when it comes to inclusion and diversity. They demand representation, yet do not have the decency, manners and common courtesy to extend an invitation of their own. And, they wonder why their assertions of “love” and “morality” are deemed politically motivated and insincere. If you are encouraged that Grand Valley is offering this program — “Religion and Homophobia: Spiritual Violence in our Community” — then let the university know: 616-331-2221. If you are in Michigan and would like to attend the panel, please visit www.TruthWinsOut.org for more information.